It's correct that the production of 1 ceramic mug requires much more material and energy than the production of 1 plastic cup, but this isn't a fair comparison. Plastic cups are generally used once or perhaps twice and then disposed of. A ceramic mug is likely to be used several hundreds of times before it breaks and is thrown away. 1 * production, transport and disposal costs of ceramic mug + 5 * 365 energy and material costs of water and soap used for rinsing the mug. I don't have the actual numbers to do the full calculation (they would also depend on the type of plastic cup and ceramic mug and how you rinse the mug), but you can see that in the long run the ceramic mug becomes more environmentally friendly provided the energy and material costs for rinsing are less than the production, transport and disposal costs of 1 plastic cup, which should be the case if you don't use lots of heated water. There are several articles on the Internet that do make calculations like this. Most articles compare ceramic mugs with paper cups but the idea is the same. Other assumptions in those articles may also vary from what I've written above (e.g. different lifetime of ceramic mug, transport and disposal is sometimes not included, or an article may only compare energy use instead of full environmental impact). The result is that those articles have different outcomes. Nevertheless most articles I've seen conclude that the ceramic mug wins if it's lifetime is long enough and you rinse the mug efficiently. 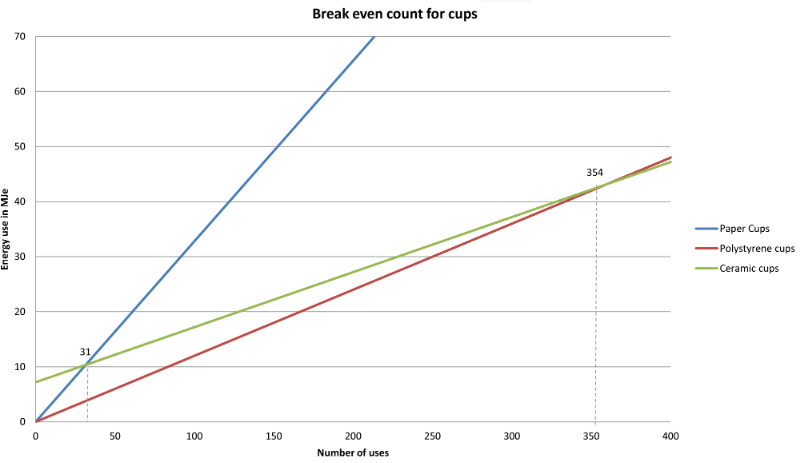 http://carbon-clear.com/files/Reuseable_vs_Disposable_Cups_2012.pdf - this article has a nice graph that shows how over time ceramic mugs win. You've pictured a disposable plastic cup. If you assume that you can use it a few times, then you might consider that you get through one a day. A ceramic cup lasts until you drop it. The cup in your photo is only for cold drinks anyway. Paper or expanded polystyrene are usually used for hot drinks. In summary, ceramic is best. If you're clumsy or use a lot of hot water in washing the ceramic cup, you might just be better off using a polystyrene cup, maybe one per day. But if you get takeaway coffee it will come in a paper cup which is much worse. The answer for this question depends on the reusability factor. The lifetime of plastic cups is very low since it could be used only few times. But even if molding Ceramic cups require more energy considering that it can be used for years before it breaks, Ceramic cups are more ecofriendly than plastic cups. Not the answer you're looking for? Browse other questions tagged energy-efficiency environmental-impact life-cycle-analysis or ask your own question. How sustainable is McDonald's espresso? Is gasoline or Diesel refining less sustainable, per energy output? What are the sustainability issues in moving house? What would be the most sustainable biomass source for (100%) ethanol production?